We have a problem in this county. We have a problem in this country, but we will stick to the county. It’s marginally easier to deal with, no thanks to this madness. A core group of people are not interested in productive discussions, compromises, or learning about anything that falls within the gray area of an issue. All sincerely held beliefs, all the time. No matter what is brought to the discussion, some people defiantly refuse to grasp what should be by now obvious. The same conversation stalls. Steve McKay’s excellent LTE takes a stab at the same old same old regarding the teachers on the council and the false equivalency to W. H. Delauter & Sons. He even has some new things to think about, if you’re the sort to think about things. And you are, aren’t you?! We love you for that! At the Frederick County Council Watch Facebook Group you would get the impression that virtually all of the county agrees that Bud is the worst in every way, and that Kirby should get to do whatever he wants no matter how abusive or potentially corrupt. He and Blaine, who is still stoking the fire from across Church St., and Billy “don’t waste my time with emails from constituents” are our only hope and salvation, regardless of the topic at hand (the horror). This is in spite of a fairly bipartisan coalition of those who do not agree with any of this and find their shenanigans embarrassing. Remember the Republicans for Jan Gardner? They do, too, but they don’t qualify anymore. There is only one way to be a Republican, and all of those people who would try to introduce a counterpoint are to be shouted down immediately. There are many alleged “RINOs” vilified every bit as vehemently as anyone who has a D after their name. If not more so, considering the constant insults flung at Bud Otis, and to (hopefully) a lesser frequency some of the Republican members of local action groups. The concept that a Democrat is not an amoral maniac bent on destroying everything is too far in the abstract to even contemplate. This is in spite of the fact that many of us from both sides of the aisle agree on many things. This is the beauty of local politics. One that they would gladly endanger. A few lonely commenters risk abuse by introducing points in the discussion proving not everyone agrees with all of the frothing whiz poppers. Rubberneckers can watch slack-jawed as they float ideas like, “Kirby Delauter brought the community together,” by petulantly and publicly refusing to donate to Catoctin Athletics (or anyone else in the community). Being an unrepentant jerk who strives to create a vacuum of decency needing to be filled is not an act of heroism. The community set out not just to fulfill the need for a donation, but to prove that our county is also full of nice people who don’t get hashtags and tantrums picked up and distributed by the AP. It is astonishing that this apparently requires time and effort to clarify. Perhaps if people are packed together in a sealed box inhaling all of one another’s toxins it affects the lucidity of their thinking. Somewhat off topic, but it seemed unfair to make Kirby look like the only unrepentant jerk. 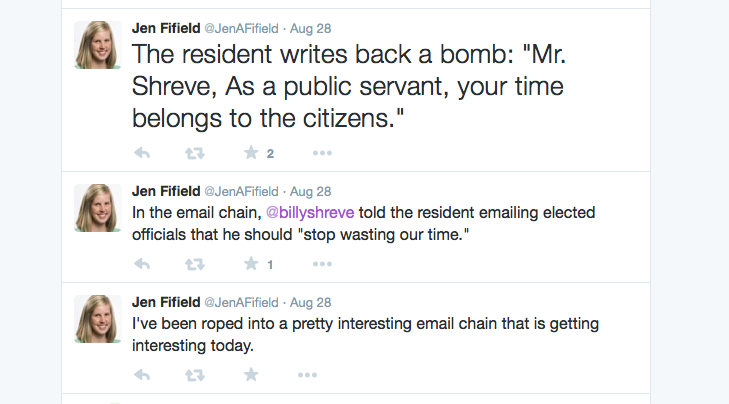 Look forward to some ranting about Jen Fifield and how justified Billy is for being rude (at least he isn’t PC, right–because obnoxious equals heroism or something). Furthermore, we were treated to a genuine work of art found here as an opinion column. A brief visit to the Frederick Council Watch Clusternut Festival will reveal some direct contradictions to this silliness. Connoisseurs of irony will find it delightful, if it doesn’t depress you too much. Is there a term yet for accidental satire? If not, there’s another vacuum to fill.